Gas TestingWhy Do I Need It? Clean Methane Systems LLC and EIP Ventures, LLC announced a joint venture named “EcoRNG” to develop more than 10 million gallons of renewable fuels from waste streams at landfills, waste water treatment facilities and dairies throughout Oregon. Why Should I Service My Biogas System with Clean Methane Systems? Clean Methane Systems has industry-leading experience in the biogas-to-energy industry, designing and operating gas conditioning systems around the world. CMS stands behind our services with a gas quality guarantee, we will guarantee the quality of your biogas when an CMS long-term service contract is in place. With over 146 projects in North America alone, CMS has the largest portfolio of biogas conditioning systems in the industry. The patented siloxane removal and H2s removal systems have been used since 1996 and are in operation around the world. dedicated to finding ways of reducing emissions, eliminating damaging contaminants, and to drive down the cost of waste to energy projects. We have built up an industry-leading number of patents. As we move forward, we will continue to engineer biogas conditioning solutions that meet our customers’ needs. Our custom-designed systems will meet your bio-gas cleaning needs. 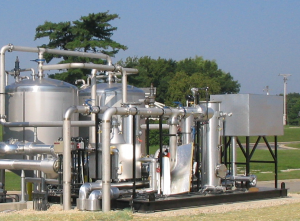 Equipment Solutions for BioGas - The biogas conditioning industry’s most experienced firm, with hundreds of global installations. Service & Support Solutions for BioGas - Services to maintain gas conditioning systems and ensure that it is producing clean biogas. CMS in the News - Visit our blog for company news and to learn what events we are attending.